Newly Renovated School is Reborn, Again. (YORK, SC) – The new renovations and additions to Harold C Johnson are complete – in just a few short weeks the school will open as an elementary school – a third life for the school since first opening its doors in 1950. Harold C Johnson first served as York Centralized High School some 60 years ago; it later transitioned to serve as the district’s only middle school, and held that title for over a decade. That is one of the reasons this transformation so exciting for the district. No doubt, the school’s renovations are refreshing. Modernizations included the demolition of one old wing and the construction of a new 17,000-square foot early childhood wing with 11 classrooms. Within those enhancements, they were able to preserve and reuse some of the original features. One example includes the preservation of most of the former high school’s original slate floor – some of the slate was even used to make built-in benches throughout the school. The original gym floors have been refinished and the cafeteria brought up to date with fresh tile and bright colors. The project is the final phase of a major York school district construction and grade level restructuring that resulted from a voter approved $85 million bond referendum back in 2007. The bond funded construction of the New York Comprehensive High School and Floyd D. Johnson Technology Center and renovations at several other schools, including Harold C. Johnson. “About 450 students are expected to be enrolled in August, and the school has a capacity of about 750 to 800,” said Assistant Superintendent Matt Brown. The opening of Harold C. Johnson will be the district’s fifth elementary school and will effectively bring enrollment at all the elementary schools down to about 450, which will allow room for growth. All five elementary schools will now house students in grades kindergarten through fourth. Harold C. Johnson will have 34 certified teachers, with three or four at each grade level. Brown recently commented on the success their district has had with general contractor for these referendum-funded projects over the course of the last few years. 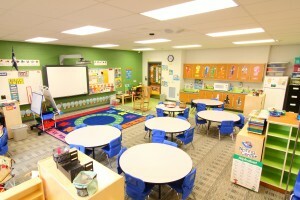 Classes begin in the York schools Aug. 17, with teachers moving in to the new space this week.